For an increasing number of us, a functional and comfortable home office design is not a luxury, but a necessity. With more and more people telecommuting to work each day, the home office is no longer a luxury—for many, a productive and comfortable work space at home is now a necessity. Numerous factors must be considered as part of an effective home office design; before setting up phone and fax lines, invest time in developing a plan. Figure out what kind of home office space you require. Do you work from home every day or only on occasion? Will the space be shared with family members? To perform your job successfully, what equipment must the office contain? Will you be video-conferencing or meeting clients in person? The answers to all of these questions may influence your home office design plan. If you regularly work from home, having a dedicated office space may help you foster improved at-home work habits (and if you meet the IRS requirements, the room can be a write-off on your income taxes). Choose a space—a room with a door, ideally—removed from the distractions of your home’s main living areas. Don’t have such a space? There’s always the possibility of converting a prefab shed into a backyard studio. If your home office will be used by different members of the family for different purposes, then be sure it’s large enough for more than one person but also private enough to facilitate work getting done. Once you’ve determined the “what” and “where” of your home office design, several key components must be added for the space to perform its role satisfactorily. Choosing the right desk depends on two things: the type of work you do and the amount of space you have. If your responsibilities are mainly confined to the digital realm, you may not need a lot of physical real estate. But those who regularly work with print-outs and reference books may require a large desk top, perhaps even multiple work surfaces. Before committing to buy, sit down at the desk and test the feel. Is the desk a good working height for you? Will it accommodate all of the equipment you require? If you access files frequently, a desk with built-in storage may be your best bet. Streamlined, modern table styles are fine to use in office settings but necessitate a separate file storage solution. You ought to have no trouble finding a desk to suit your style and budget, but remember, there are DIY options, too. The most important piece of furniture in your home office design is the chair. There are many styles from which to choose, but resist the temptation to make your selection on the basis of aesthetics alone. Look for a chair that offers sufficient depth; the ideal seat supports your thighs without touching the back of your knees. If you are prone to lower-back pain, insist on a design that provides adequate lumbar support. And if not adjustable, be sure the chair’s height is appropriate for your desk or worktable. Plenty of excellent options exist in the $100 to $200 range. Take your time and when faced with a choice between comfort and good looks, err on the side of comfort, which is likely to enhance your level of productivity. What other work areas would it be wise to add? Those who review large documents or assemble materials may appreciate the virtues of a standing desk. If you expect to host clients for face-to-face meetings, think about including a small conference table. The best home office design will respond sensitively to the realities of your day-to-day schedule. Love it or hate it, technology is the reason so many of us are able to work from home—embrace it! If you are shopping for a new computer, fax machine, or copier, get the best your can afford. That way, you can be assured that your equipment will be compatible with the latest software and operating systems. When possible, choose hardware with wireless capability, and if you can, go paperless. Lighting plays a major role in home office design. As in other rooms, the best approach here is to layer lighting from multiple sources. Use table lamps, floor lamps, and wall sconces to achieve diffused, ambient lighting that fills the room. While natural light is certainly a plus, direct sun may result in glare. Install window treatments so that over the course of the day, you can control the amount of daylight admitted through your windows. For task lighting, use desk lamps that not only deliver the quality and intensity of light you prefer, but also provide flexibility through design features like adjustable swing arms. 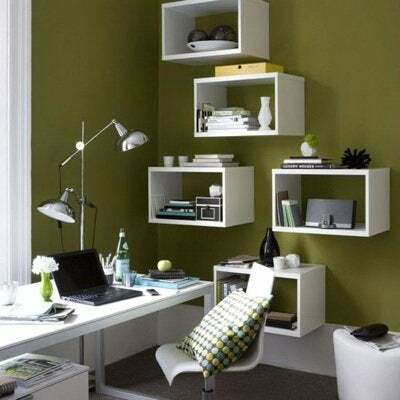 No matter the details of your home office design, organization is key, particularly in a shared space. Find a categorization routine that works, then stick to it. Since all those cords and cables are a distracting eyesore, look for ways to consolidate and conceal them as well. The last step in creating the perfect home office space is making it your own. Add personal touches that make you feel comfortable and that inspire creativity. Your home office can and should be a place you can grow and prosper.